Do you have a Plumbing emergency in Edmonton? Call us right away! We have expert plumbers available 24 hours a day, 7 days a week. Our plumbers are licenced, insured and drug tested. an a plumber put a smile on your face? This is a question that we prove “YES” is the answer to every day. Our plumbers in Edmonton, besides being gentlemen, are some of the best workers in the business and can turn your plumbing dilemmas into pipe dreams. Our plumbers want to help you save money on both services and products. Plus, they care about the world above the pipelines. For example, did you know that a low-flush toilet can save you up to 18,000 gallons of water per year? That's a large chunk of your water bill, unnecessarily wasted on excess water. If you'd like to save some money and help the environment by preserving water, you can get a low-flush toilet installed in every bathroom of your house, conserving the health of your environment and checking account at the same time. You will notice a huge change to your wallet every month and know that you’ve made an investment in your home which will last for years to come. We are extremely easy to work with, no matter your problem. We know that plumbing disasters can strike at any home in any season, and usually need immediate attention. Because of that, we provide 24-hour plumbers that are available whenever you need them. Don’t delay because you’re nervous about finding plumbers that will be available. We’ll come to your home with all of our plumbing supplies in tow, so whatever your plumbing problem is, it can be fixed on the spot. We take good care of our customers and have a loyal customer base that will testify to our level of professionalism and the results we provide. We get most of our new clientele through word of mouth alone, and are proud to be some of the most respected plumbers in Edmonton. Plus, our plumbers are capable of doing more than just unclogging toilets and fixing leaky faucets. They can enhance the heating of your home and reduce the amount of money you're wasting on water. Plumbers can also examine and repair water heaters and refrigerators, and some plumbers will even help you with your sprinklers. 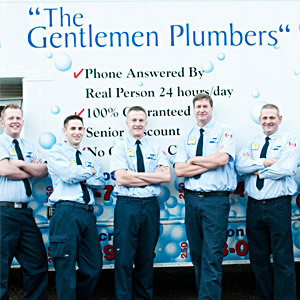 Plumbers in Edmonton aren't hard to find, but to get guaranteed and professional service, you need to start by calling the Gentlemen Plumbers . We keep our prices competitive and are willing to consider your circumstances in our quotes for service. We hope you’ll call us today. Thanks for visiting!